Extended map type reference sets are very similar to complex map type reference sets, but also allows specifying map categories for an associated reference set member. In case of ICD-10 the individual category values are subtypes of 447634004|ICD-10 Map category value|. For further information about extended map reference set, refer to the IHTSDO Technical Implementation Guide. To create an extended map type reference set, click on the corresponding button in the main tool bar . You can also right-click on the folder in the reference set view and select New extended map type reference set from the context menu. 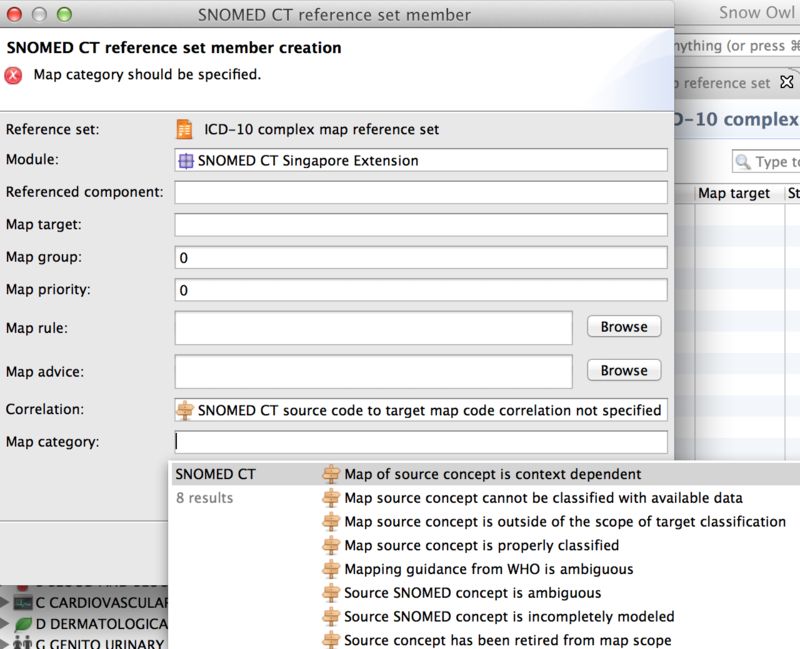 The Referenced component is SNOMED CT concept. As a Map target, you can select: ICD-10, ICD-10-AM or Unspecified. Click Finish to proceed. The default setting for map category is Map source concept cannot be classified with available data. Use the quick search wizard to specify a map categories. As you can see in the screenshot, only valid results that are subtypes of the metadata concept ICD-10 Map category value are displayed.